And to be honest, I like whole grains in sweet baked goods at least as much for their hearty flavor as for any health benefit they confer (I mean, we’re still talking about cake here). These whole wheat chocolate chip cookies, this rye flour zucchini bread (also a cake, of course)—the whole grains add a layer of flavor and texture that leave more refined baked goods tasting rather insipid in comparison. This loaf, like any good banana cake, is dense and moist. I like the crunch of walnuts in mine, but you can leave them out. Use chocolate chunks rather than chips if you can; the larger pieces punctuate the bread more dramatically. You can also buy a bar or chunk and chop it yourself; just aim to leave lots of bigger shards along with the inevitable crumbles. Banana Bread with Bittersweet Chocolate, Whole Wheat, and Olive Oil (adapted from a rather different but great-looking cake on 101 Cookbooks): In a medium bowl, mix 1 c. whole wheat flour, 1 c. all-purpose flour, 3/4 c. dark brown sugar, 3/4 tsp. baking soda, 1/2 tsp. kosher salt, 3/4 c. bittersweet chocolate chunks, and 3/4 c. walnut pieces. In a larger bowl, mash 3 bananas then stir in 2 beaten eggs, 1/3 c. olive oil, 1/4 c. plain yogurt, and 1 tsp. vanilla extract. Stir the dry ingredients into the wet just until combined. Scrape into a greased 9×5 loaf pan and bake at 350 until the top is golden and a few crumbs adhere to a tester toothpick. Let cool 10 minutes in the pan before turning out onto a rack to finish cooling. We are big fans of banana cake. I think it is important to call it cake, actually, to subtly remind little people (and big people too) that it is indeed a treat. Do you think this one would work well in muffin form? It looks like it could, but I have yet to find a banana-cake recipe that really bakes up muffin-sized as well as it does in its bread version. Hm … might have to try it! Bread or cake, that looks great. 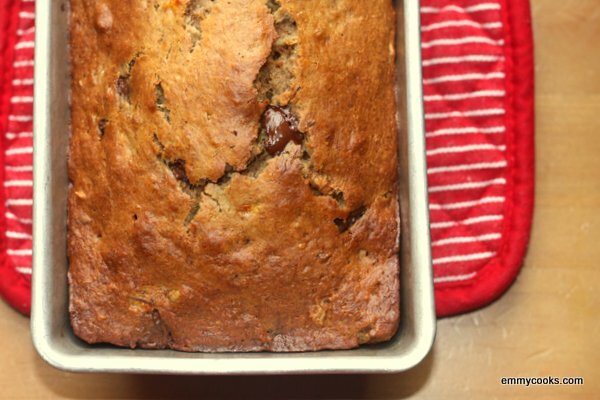 gorgeous – banana bread is up there with my favourite cake. I’ll take mine as bread or cake – it’s a favorite either way! Love the bittersweet chocolate peeking out! Lets call it bread. Then I can eat lots of it. Love the olive oil and yogurt! Creative way to reduce fat.